This past weekend was a busy one (and I’m not just saying that!) The annual Unity Christian Music Festival was Wednesday, Thursday, Friday, and Saturday. I ran a half-marathon distance. And there was the True Believers Fest by Marquis Comics where comic fans, wrestlers, and more came together. While it was a great weekend, it put a damper on my movie watching and I was unable to get out to the theater. The sad part is, there are some great movies in the theater that haven’t received the Reel Leadership treatment. Movies like Mission Impossible: Fallout, Christopher Robin, and The Meg. So, I browsed Netflix and found a film that had peaked my curiosity before. It looked silly and fun. That movie? Antboy. Antboy tells the story of a 12-year old boy Pelle Nøhrmann (Oscar Dietz). He was bitten by a super-ant and given superpowers, much like Peter Parker was bitten by a radioactive spider and became Spider-Man. Pelle goes on to stop bullies, rescue damsels in distress, and battles The Flea (Nicolas Bro). Through all of this, Pelle learns important lessons and I’m going to translate those into leadership lessons you can take away from Antboy. Throughout Antboy, the filmmakers used various mediums. They switched between live-action and artistic comic book style panels to explain what was happening. These breaks allowed viewers to watch Antboy and take it in through various methods. It added something special to an otherwise okay movie. Do you explore other leadership styles? You may be comfortable leading completely as a servant leader. However, would you and your team be better served if you tweaked your servant leadership style and added transformational leadership skills to your style? Try out different leadership styles. Some will fit and gel better than others. However, I think you’ll find adding in new styles will help you become a better leader. Pelle’s teacher (Nanna Schaumburg-Muller) had an assignment for her class. She wanted the students to interview an interesting member of their community. To do this, she ordered the students to team-up in pairs. His teacher knew they could do the work on their own. Yet she knew the work would be better if they had someone to work with. As a leader, you can’t lead well alone. You need people in your life to help and support you as you lead. Find people in your life to partner up with. This could be as business partners, friends, or pain partners. One day, Pelle was on the roof of his school. He saw a classmate, Wilhelm (Samuel Ting Graf), being bullied. There were two boys and they were pushing him around… Making fun of him because of the comic books he was reading. Pelle couldn’t stand to see the boy attacked. So, he did what great leaders do. He stepped into the conflict. He threw an apple at the bullies. Great leaders don’t let conflicts go unaddressed or unresolved. They know conflict breeds dissension and frustration. Thus, great leaders step into conflict. They help their teams resolve conflicts and grow closer together. Pelle stopped the bullies. They were no longer attacking Wilhelm. Instead, they turned their attention to Pelle. The bullies came hard after Pelle. They chased him and told him he was dead meat. All Pelle wanted to do was help! And know he was being chased down. Oh boy! You have to know whether you do good or bad, there are consequences. Sometimes those consequences won’t seem fair. Especially when you did something well or right and it blows up in your face. There was a sadistic gym teacher Pelle had to put up with. During one of the abusive sessions, the gym teacher called on Pelle to battle him in joust. The first to go outside the circle or drop the jousting stick will lose. The gym teacher lays out the rules. Before he does this, he prefaces it with the line above: The rules are simple. Do you lay out the rules before you get into the details? Letting your team know what to expect and the boundaries they have will go a long way in creating an atmosphere where they know what they can and cannot do. While the gym teacher did this in a negative way, you can spin this into a positive. You can help your team know what to expect. Pelle was being beaten by the gym teacher in joust. He was knocked out of the ring and lost his jousting stick. The gym teacher knew Pelle was better than this. Once again, the gym teacher was aggressive in his leadership style. He was abrasive and rude. Yet he pushed Pelle to be better. And Pelle took out the gym teacher. Could you be more challenging with your team members? Do you need to speak up and tell them they could do better? If so, challenge your team. Let them know they can do better. Also, let them know you believe they can. When Pelle and Wilhelm talked, Wilhelm knew something was different about Pelle. Pelle began to share his story with Wilhelm. And their relationship changed. Relationships change when we began to break down walls and become real with one another. Pelle shared a dangerous secret with Wilhelm. One that could put both of them in danger. The secret story also made them closer to one another. Are you sharing your story with your team? Are you letting them know where you came from, your history, where you’re going? Sharing your story with your team will help encourage them. They’ll see regular people can become leaders. They will see you as someone who has had to overcome struggles and challenges too. You’ll be an inspiration! Wilhelm was a comic book nerd, much like myself. He knew when people gained powers, they needed to learn about them. They also need to learn about their weaknesses. Wilhelm did what any smart person would do. He began to research the strengths and weaknesses of ants. What he discovered was amazing! Super biting power, wall climbing abilities, and acidic urine (yup, there’s that!). Have you researched your strengths? There are various ways you can do this. You can toss yourself into a leadership position and test them by fire. There are leadership tests and assessments you can take. You can also ask your team and trusted friends what they see as your strengths. You’ll learn much about yourself through this process. Now, go do some research! Pelle began to use his influence to gain attention for himself. He wanted fans and to be liked. After all, he wasn’t popular without his powers. Now he could be. Great leaders know they can’t lead to gain fans. They lead because they know they can help their team members become the best version of themselves. Always check what your motivations are for leading. Make sure they align with your values. Pelle and Wilhelm studied ants and discovered their strengths. One of those strengths was acidic urine. If you ask me, this is an unusual strength. It’s also a messy strength. Every time you go to use the bathroom, you run the risk of dissolving the toilet. Uh oh! But Antboy’s unusual strength came in handy. After Pelle’s love interest, Amanda (Cecilie Alstrup Tarp), was kidnapped by the flea, he tracked her down to old Mrs. Gæmmelkrå house. When he arrived there, he discovered a giant lock on the door. He used his strength to dissolve the lock and find Amanda. You may think you don’t have any strengths. Or maybe your strengths are weird, unusual even! Don’t fret. Those unusual strengths may come in handy. Look for ways your unusual strengths can be used. You will be surprised. Antboy was fighting The Flea when he began to run low on energy. He began to struggle. However, he knew how he best recharged. Ants use sugar to gain energy. Because of the super-ant bite, Antboy could recharge the same way. He needed sugar to recharge! Discovering how you recharge will help you keep going on those long, tiring days. It’ll also allow you to quickly boost your energy when you need it. There’s plenty of other ways you can recharge as a leader. However, the key is discovering what works best for you. You know what your weakness is? Your bloodtank is empty and you have no friends to help you! During Antboy’s fight with The Flea, Wilhelm and Antboy disconnect and destroy The Flea’s blood tank. The Flea needed the blood tank because he was energized like a flea, through blood. When Antboy and Wilhelm destroyed the tank, The Flea lost his energy source. The Flea was also alone. There was no one around to help him. The Lone Ranger style of leadership is lonely and dangerous. It puts you out there by yourself. With no friends. Be sure to have a group of people you can count on. You will need people in your life! Question: Have you seen Antboy? If you have, did you see any leadership lessons in Antboy? 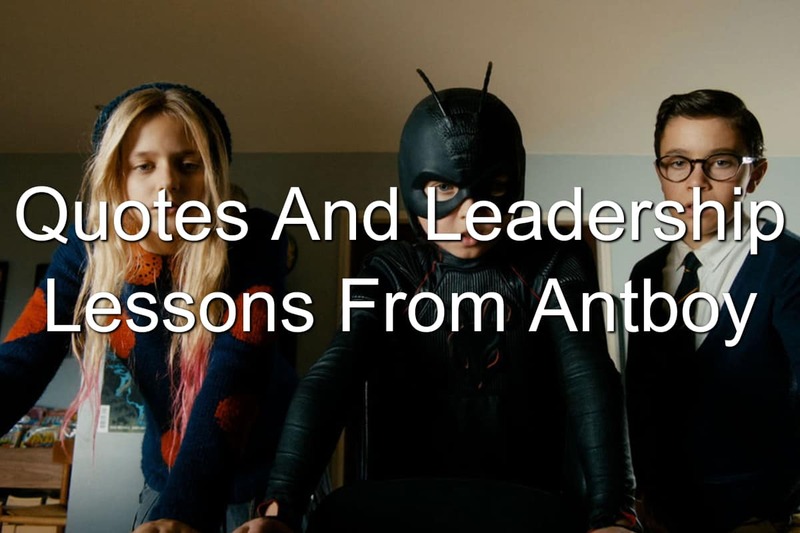 If you haven’t, what leadership lessons from Antboy that I shared resonated with you? Let me know in the comment section below.